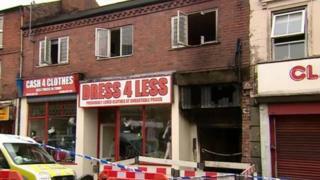 A man has been cleared of killing a woman in a fire in Worcestershire. Sandra Nowocinska, 22, died after being rescued from a flat in Horsefair, Kidderminster, in November 2014. A five-year-old boy was injured. At Worcester Crown Court, 43-year-old Mark Moat was cleared of manslaughter and arson being reckless as to whether life would be endangered. But he was convicted of arson in relation to a fire earlier in 2014 and will be sentenced on 4 March. He had admitted a charge of threatening to destroy property.